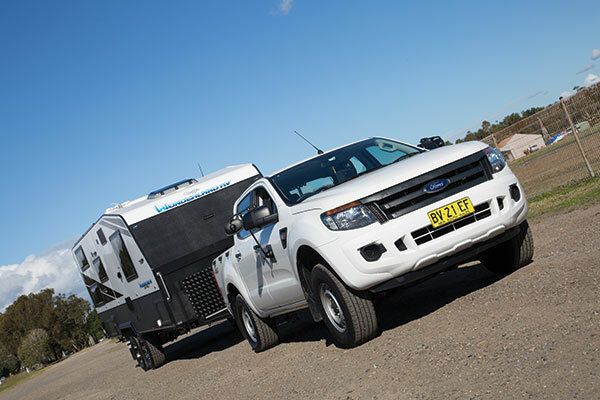 There are a few things that set Melbourne-based Wonderland RV apart from its rivals in the busy heartland of Australia’s caravan production. A quick look under the skin of the family bunk model Amaroo Hornet 2200 shows a few key differences that I thought worth exploring. 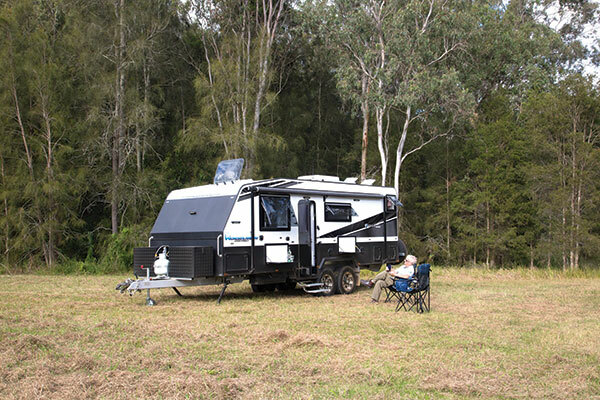 Wonderland dealer, Five Star Camper and Caravans at Newcastle, NSW, supplied the Amaroo for this review, so I set off for the Watagans area on the eastern side of Lake Macquarie to explore. The Hornet has a Tare of 2920kg and an ATM of 3500kg, giving a payload of nearly 600kg. What that means, though, is that you’ll need a pretty hefty tow vehicle once you load the family and all your gear into it. The van has an external length of 6.8m (22ft 4in), offering good space for a family, and the impressive power and water capacity will allow you to enjoy a decent family holiday off the beaten track, without having to return to town every second day! It features a 240A lithium battery, 450W of solar power and a 3000W inverter, plus three 95L fresh water tanks and an additional 100L tank for all your grey water. 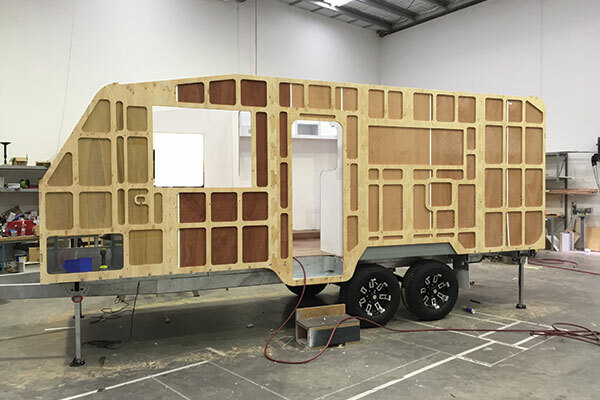 Underneath the van’s smooth aluminium cladding, there is a timber frame – but one with a difference. It is made with full ply sheeting rather than individual components, the ‘sticks’ structure which is more common. 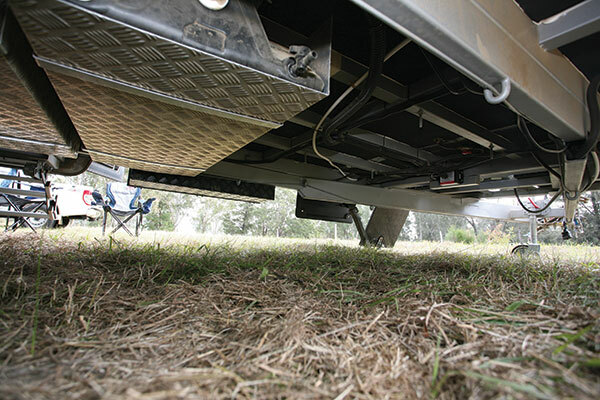 Keeping it all together is a hot-dipped galvanised box section chassis that rides on AL-KO Enduro Outback independent suspension fitted with 16in alloy wheels and offroad tyres. There is no front boot for storage but there is a tunnel boot. 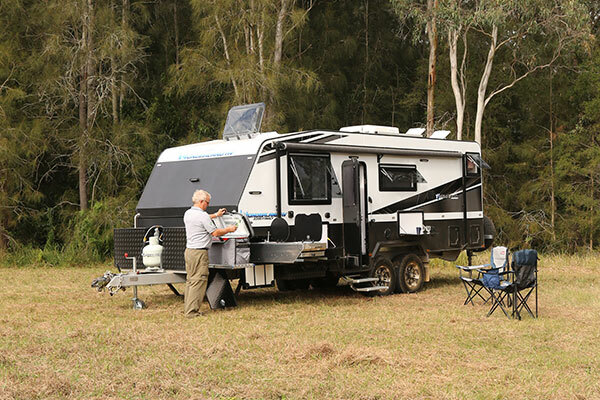 The boot is largely occupied by a slide-out kitchen, however, there’s also a smaller storage bin fitted to the rear offside which is under the lower bunk bed and accessible from both inside and out. 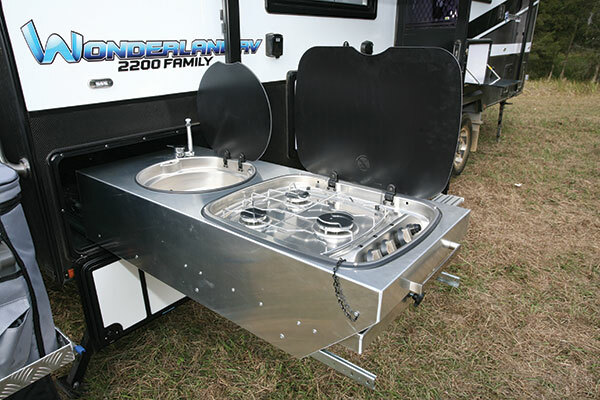 On the drawbar, there are two optional toolboxes, which are large enough to hold big ticket items like a fridge or a generator, which may make family camping easier. You’ll need to keep the loaded towball weight in mind, though. There an additional storage box and jerry can holder fitted to the rear bumper, with a spare wheel. Like many vans of this size, the bunks are generously sized at 1.88x0.75m (6ft 2in x 2ft 6in). Up front, the island bed is a little longer than usual at 1.95m (6ft 5in) but has the standard width of 1.53m (5ft). 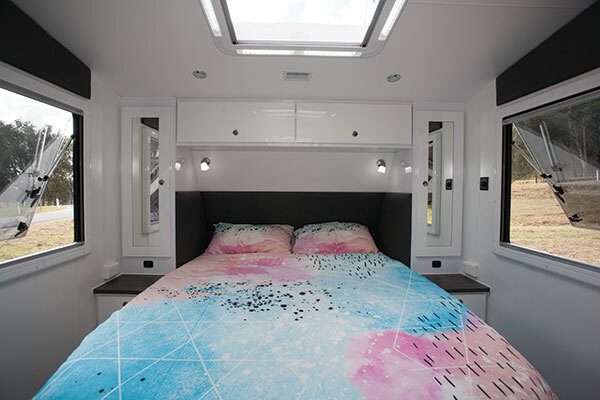 The bunk beds, like the front bed with its flatscreen TV, are well equipped with their own TVs that fold down from the ceiling and bed base, as well as reading lights and the added bonus of 12V fans. The kids are going to love all of that! And ventilation by the bunks isn’t a problem because both have large adjacent windows. Older caravanners will remember more basic beds (a mattress and nothing else) so the kids of today are doing very well indeed! 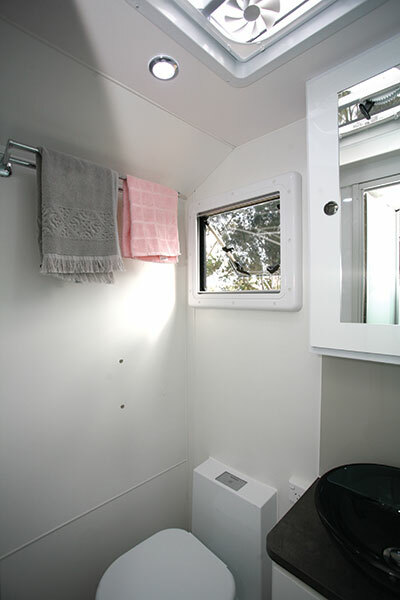 The bathroom comes with a shower cubicle, cassette toilet and washbasin. Adjacent, the washing machine hides in the lower wardrobe area between the bunk beds and bathroom wall. All the standard items are fitted into the Amaroo kitchen, including a Dometic 190L fridge, four-burner cooker with grill and oven, stainless steel sink/drainer and a Sphere microwave. The fridge is a two-way, 240V/12V model, which is actually a re-badged Waeco. In addition to the wire basket slide-out pantry, there are three overhead lockers, one cupboard and four good sized drawers, including a cutlery drawer. At either end of the kitchen bench there is a nominal amount of benchtop. That is supplemented by the table near the L-shaped lounge facing the kitchen. It comes with a substantial footing that can be raised and lowered as needed. A family of four can probably fit around the table, but at least one person will need an extra seat. 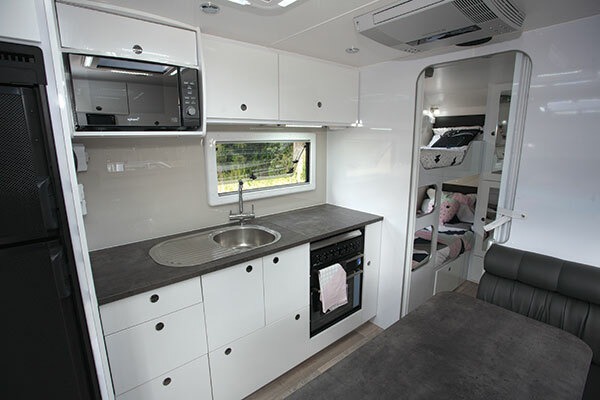 As well as the internal kitchen, the Hornet has an external slide-out bench, which also comes with a stainless steel sink and a three burner cooker – a nice addition for a family holiday. 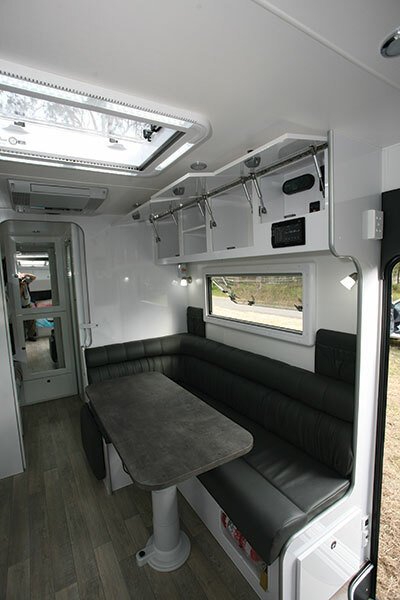 Above the dinette, the end lockers contain the RV WiFi unit which is sure to be a hit with the kids, 12V circuit fuses, battery monitor and water pump/heater switches. The touchscreen entertainment system is also found here and bound to be handy for the junior members’ entertainment. There’s no doubt that this Amaroo Hornet is a very well-appointed van, especially with the extensive list of options fitted. The options do push up both the price and weight, but if you are happy to live in it as it comes in its standard form, it’s easily done. All those extras add weight! The full feature appeared in Caravan World #567. Subscribe today for the latest caravan reviews and news every month!